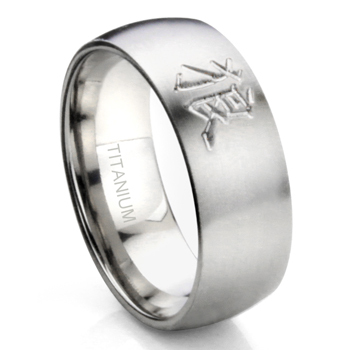 Express your personality and belief through this Kanji tattoo titanium ring. A Kanji character is carved into this 8MM dome wedding band ring. We accept custom request for any Kanji character so that you may choose the word you like and create your own Kanji tattoo titanium ring. There are many benefits for choosing titanium for your wedding ring instead of gold, silver or platinum. One obvious reason is the cost, e.g. titanium rings only cost a fraction of the price of any gold or platinum ring, yet they do not tarnish like silver or white gold do. Also, precious metals are generally very soft, but titanium has the highest yield strength relative to its weight so it will never bend out of round. Titanium rings are also hypoallergenic, tarnish proof and conflict free.